Greg Hidalgo has extensive experience counseling and providing innovative and client-centered solutions for publicly held and privately owned clients, routinely offering value-added, strategic advice regarding complex matters, in the areas of mergers and acquisitions (M&A), joint ventures, corporate governance and other corporate-related matters. He also counsels clients in corporate finance and capital market transactions. In The Legal 500, Greg was described as "superior" by his client. 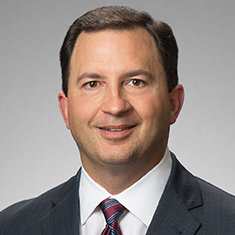 Following an acquisition, one general counsel of a private equity owned client stated, "It was a fantastic client experience… Not only is Greg a great lawyer and a former accountant, but he also has a great business acumen." Greg represents clients in a variety of sectors, including private equity, manufacturing, health care, technology, consumer products, food and beverage, restaurant, retail, energy and telecommunications, giving him a unique awareness of the business challenges that clients face. Greg began his career as a certified public accountant with Ernst & Young LLP, where he worked from 1987 to 1990. He regularly utilizes his financial experience when representing clients. Greg speaks frequently on various hot topics at conferences and on webinars, including issues such as negotiating the fraud exception, the black art of winning M&A auctions, transitioning closely held businesses, trends in international business transactions, and "hot M&A" topics. He was involved in the transaction named "Number One M&A Deal" by the Dallas Business Journal "M&A Deals & Dealmakers" in 2010. Shown below is a selection of Greg’s engagements. Representation of a stock exchange-listed provider of hospice services in its $147 million acquisition of a peer; several other acquisitions; and a subsequent $1 billion merger with one of the largest US providers of home health care, hospice and related services. Representation of a private equity-owned, long-term acute care hospital system in its $550 million sale through an auction process to another private equity group. Representation of a private equity group in its $108 million acquisition of a health care group purchasing organization. Representation of a stock exchange-listed integrated health care system in its sale of its lithotripsy services business. Representation of the special committees of two stock exchange-listed companies, one in the retail industry and the other in the payday loans/cash advance industry, in their respective $179 million and $430 million sales to private equity groups. Representation of a stock exchange-listed diversified industrial company in its acquisition program, including its $600 million acquisition of the steel structures division of a multinational Swiss company and its acquisition of a trench shielding and shoring equipment manufacturer. Representation of an NYSE-listed commercial real estate services company in its $2.2 billion merger with another stock exchange-listed commercial real estate services company. Representation of restaurant chain owners, franchisors and operators in acquisitions, dispositions and joint ventures. Representation of a stock exchange-listed leading manufacturer and supplier of water and drainage related products in its acquisition of a complementary manufacturing business. Representation of several mid-sized to large owners and operators of convenience store and fuel depot chains in acquisition and sale transactions. Representation of several public and private food manufacturing and distribution companies in acquisitions and dispositions of food manufacturing and distribution businesses, including a private equity-sponsored company in its $370 million bankruptcy asset acquisition of Vlasic and other food brands; a private equity sponsored-company in its $485 million sale to another private equity group; a private equity-sponsored company in its $600 million sale to a stock exchange-listed company; and a private equity-sponsored company in its $45 million acquisition of a Canadian food manufacturing company. Representation of an oil and gas exploration and production company in a series of acquisitions of energy-related assets aggregating $3.9 billion and the $250 million sale of energy-related assets. Representation of a US oil and gas exploration and production company in its $590 million acquisition, via tender offer, of a public Canadian oil and gas company. Representation of a stock exchange-listed oil and gas exploration company in its sale to another stock exchange-listed company via a $2.9 billion tender offer. Representation of several US companies and underwriters in initial and secondary public offerings, including a hospice service provider in its $54 million IPO and $131 million secondary offering by stockholders; the underwriters for a lighting company in its $24 million IPO; the underwriters for a bookstore owner and operator in its $44 million IPO; one of the largest owner/operators of radio stations, by station count, in its $589 million IPO; and the underwriters for a $475 million secondary stock offering by stockholders of a leading information technology company. Representation of several US companies in issuer tender offers, including a leading information technology company in its $1.4 billion issuer tender offer for hybrid securities and a commercial real estate services company in its $75 million modified Dutch auction issuer tender offer. Representation of several stock exchange-listed companies in connection with SEC reporting and corporate governance compliance. Representation of several companies in their respective private placements of securities.